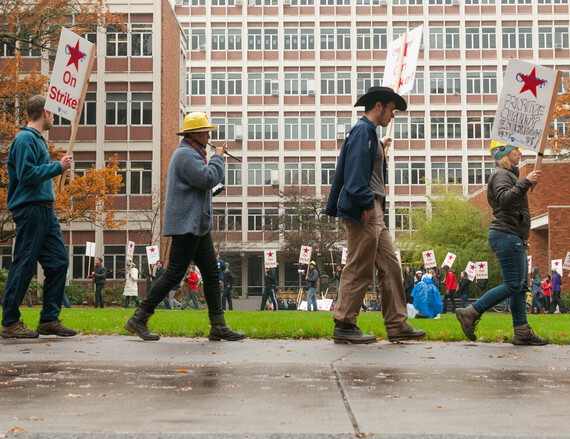 I am a graduate student currently on strike in Eugene, Oregon. Our union is asking for fair wages and paid leave for medical emergencies or for the birth or adoption of a new child - pretty basic, right? 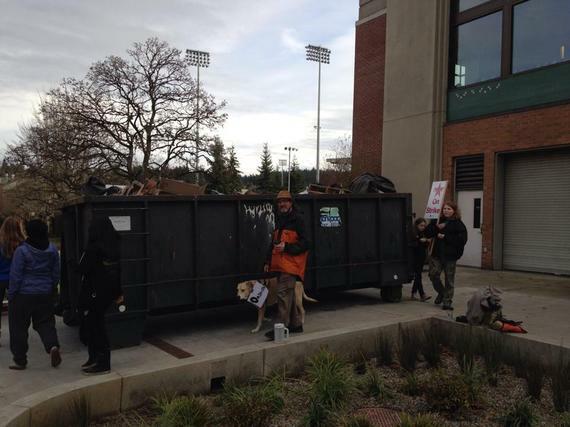 Yet somehow we've been on strike for almost a week and the University of Oregon (UO) refuses to budge. My union is the Graduate Teaching Fellows Federation (GTFF), which includes teaching assistants (TA), research assistants (RA) as well as a very small number of museum assistants (MA). These are people who fall into the unenviable position of working 45-80 hour workweeks, getting paid for 10-20 of those, and getting fired if they don't work the others (because those unpaid research hours are what we really got hired for). But because we are students, our Administration thinks that we should be grateful for the piteously little they offer us. Currently the minimum wage for new GTFs working half time is $1363.33 a month (before taxes, fees, and health insurance costs! ), yet the University predicts that it costs $1590 a month to live in Eugene - a pretty significant gap over a two to seven-year degree. Previous union battles have also gained us an incredible health package, and full tuition waivers. The latter is important, though not for the usual reasons: few grad students take real classes after their first or second year, since graduate education is self-driven, but the terms of our contracts require that we take full course-loads or we lose our fellowship. Tuition waivers pay for the classes that our fellowship requires we take that we would otherwise not take - the circle of nonexistent money. 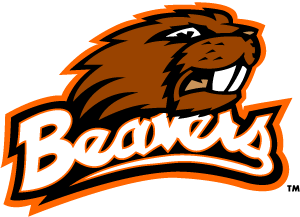 The University would like us to think this is a competitive and generous package, which is a litte bit weird because Oregon State's minimum wage for half time GTFs is $1777 a month. Also, they're getting a 3% raise every year for the next few years: in 2016 they'll be making $1885.5. The money the Union was bargaining for (5.5% raises each year) will lead to us having $1517.42 dollars per month - still trailing behind OSU by over a 350$ gap. With the wage increases UO has conceded during negotiation (5% and 4%), we'll have only $1488.76 per month - nearly $400 less per month than our rival school. That's why our paid leave package is such a great deal for the administration. It should cost about $52,000 dollars per year for the University (.4% of their 65 million dollar surplus) to give two weeks of paternal, maternal, and medical paid leave for GTFs who need it. Frankly, that is incredibly cheap, and it makes it so even people working less than half-time (as many GTFs do) can benefit and feel genuinely lucky to go to school here. They've sent out emails saying that only 22% of classes didn't have instructors on Tuesday - a funny choice, since we actually only teach 33% of classes which actually makes that a pretty inspiring stat. I guess they thought we weren't very good at math? They've sent out emails trying to circumnavigate the "you can't ask your students if they're striking" rule by flat out asking if we're on strike or not, please check this ticky box and let us know! Our union gave us a wonderful form letter that we all took great joy in sending back to the administration. To get around the fact that GTFs are on strike and they still can't get anyone to scab on us, a lot of the departments will now administer scantron multiple choice tests... including every class in the math department. Can you imagine taking a multiple choice calculus test? Well, you probably can - but it's a bit harder to imagine succeeding on it. Some of the things they've done have been less than funny, though. They've twice told the International students that they're at risk of losing their visa if they continue to strike. This is incorrect and is simply intimidation - which isn't just morally wrong, it's also illegal. 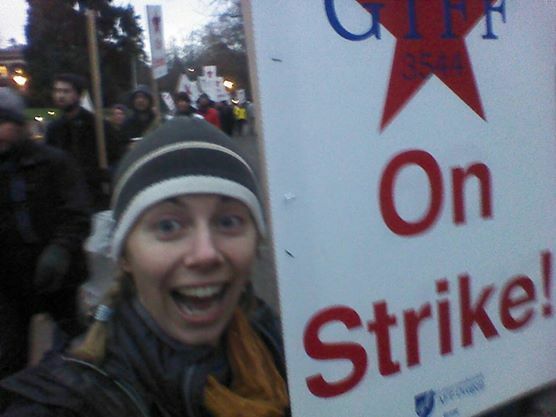 The math department has been getting threatening emails about GTFs deciding whether or not to work next week, and departments across campus are replacing GTFs with department heads for grading purposes... even GTFs who aren't on strike. What the Administration has been trying to do is economically understandable - it seemed cheaper to break the union than it did to actually pay them. It's not, in the end - it has cost them about $250,000, but all the same - I'm sure it made sense at the time, monetarily if not ethically. What the administration needs to realize now is that they are losing this battle and tarnishing the UO's reputation as they go. They don't seem very concerned about it though. I mean, to give them the full measure of their ever-dwindling credit, they've got a LOT to go up against here. We are Ph.D. and masters students, ALL of us, which means we're pretty smart. Also we outnumber the administration, so our collective brain power is much larger than theirs. On top of that, we've got more motivation and steam than they ever could have counted on - I mean, to start with did they forget how many of us have been hit or nearly hit by cars while biking in Eugene? Medical leave is a pretty obvious necessity. But it's not all anger and shouting. We've also got fun things on our side, like robot dinosaurs, free cookies and pizza, and charming and well-behaved pro-union dogs. Our message is pretty unbeatable too: did you know that by standing for the union, you are proudly declaring yourself to be Pro-Baby? In fact, because graduate students are bringing their small and adorable children to march with us in our picket lines, we get to surround ourselves with cuteness and proudly declare we support it. Anti-baby is a real hard counter-stance to take, and we reluctantly admit we are both confused and impressed by the administration's tenacity in sticking to it. It also doesn't help that we are better at making friends than the UO administration is. Deliveries have ground to a halt because UPS and Teamsters (the union that represents drivers and delivery workers) cheerfully refuse cross our picket lines. Our construction workers chose to forgo paid days of work on the university's beautiful new buildings. State Senator Michael Dembrow marched with us this week. The City Mayor is on our side. Lane Community College has refused to do our jobs, and our faculty refuse to cover our lost work in solidarity (as well as writing scathing open letters and editorials). We've had people come from Portland and Corvallis specifically to picket alongside us, and people in Berkeley picket football games in our absence. Over 10,000 people have signed our MoveOn.org petition in the first three days it was up, and numbers keep rising. Our union president is also talking to Representative Peter DeFazio and Governor Jon Kitzhaber so our friend circle is just constantly getting classier as well as exponentially larger. Speaking of real classy, turns out the Teamsters union also works for Sanipac and won't cross picket lines to take out the trash! Throughout all of this, our union has remained legal and friendly. We're probably going to start handing out earplugs to undergrads so that they can study for finals this week. The police here like us too - they've been around, of course, in full force, but there have been no arrests or anger of any kind. Instead they've just been waving at us while we're picketing which is super sweet - turns out that the same unlikable law firm the UO hired to bargain with us is also in the middle of bargaining with the police officer's union. Speaking of friends, even the administration has to admit that their attempts to turn the undergrads against us was sort of poorly planned out. I mean... were they not aware that we teach them? That we talk to them in class about the strike, and use our own email listserves to send personalized emails to the students who wouldn't have passed the class without our help? At this point we've been handing out so many buttons that we've actually broken our button maker - but don't worry, somebody gave us theirs. We can't actually count how many "I Love My GTF" buttons we've given out, but I personally handed out about 50 in about 5 minutes on Wednesday, so I'm pretty positive the undergrads have forgiven us for making such a big racket in front of their empty classrooms this week. Which has been pretty noisy. Oh man, that reminds me: have you seen us on the news? When the strike first started, my mom advised me that I would want to have many pictures of myself holding a picket sign so my children could see me in my 'activist phase'. 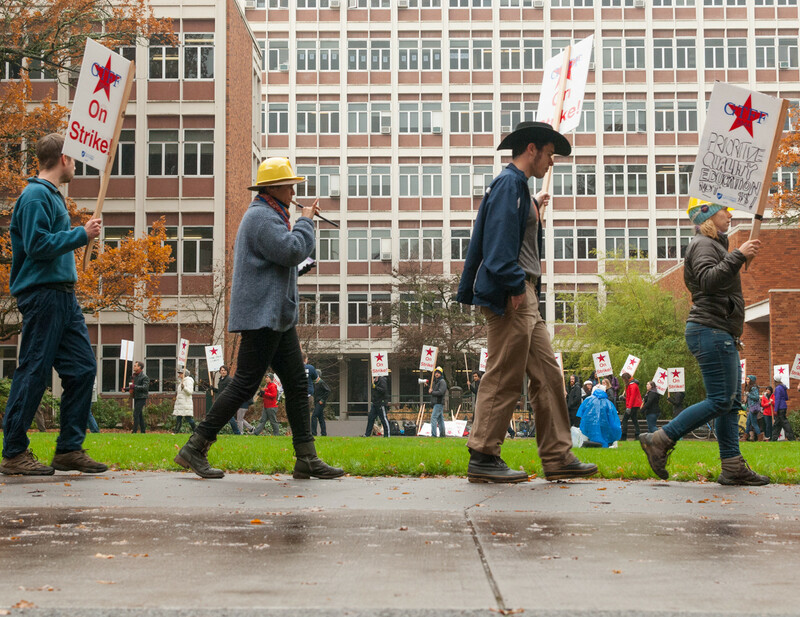 Well it turns out that will not be a problem, since I am now part of the longest academic strike in Oregon's history, and there are photos of me and my picket signs all over the internet. SEE MAMA? I need a pair of bell-bottom jeans to really complete the picture though. I guess what I'm really trying to say, is that I get it what the University of Oregon Administration Team has been trying to do here. They've tried to demoralize us instead of negotiating with us. They've insisted on pretending everything is fine: as an example, they're still running campus tours (which is HILARIOUS - I mean, did they think we wouldn't talk to them? Who do they think we're giving half our buttons too??). But the UO Administration made a big mistake when they decided to go with union-busting over actual negotiation. Each action they take brings more people running to us, because "please let us have babies and be sick sometimes" is a pretty powerful message. Every day they drag your feet, the University of Oregon looks worse. Don't believe me? 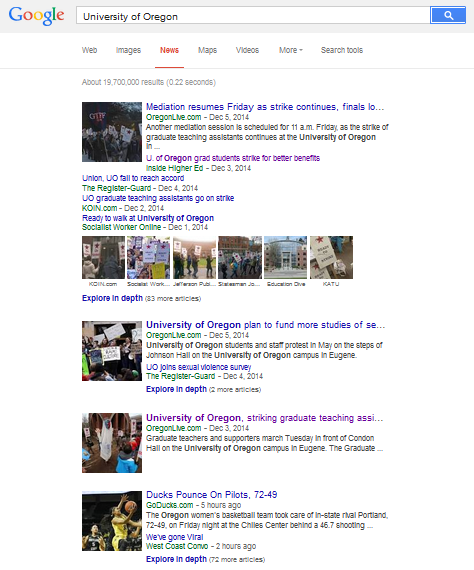 Do a google news search for our university's name. The first thing we should see is that our football team just destroyed at the Pac-12 conference and are headed to the Rose Bowl. Instead, the first four hits when I wrote this were the world's worst PR campaign - one that the Administration ignited through their own incompetence. 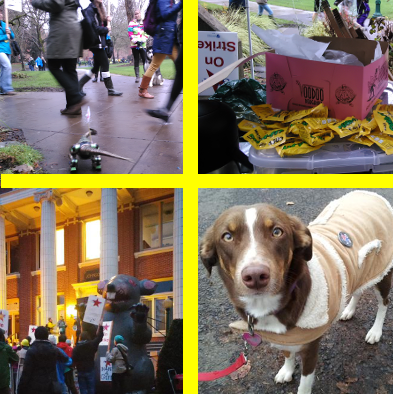 Sexual Assault Scandals and Striking Workers: Come to the University of Oregon! We are the under-paid, overly-educated employees of this university and we have the power of righteous indignation on our side. The administration have tried waiting us out, assuming that we would fizzle but how can we when every day we have more people support us? I see new faces on the picket line every day - at this point I've given up on learning names because there are simply too many of them. Our supporters buy us food, too, and graduate students love nothing more than we love free food! That means that picketing is free exercise (9-23 miles walked per day this week! ), a chance to meet new friends, offers more sunlight than most of us lab-rats see in a month, and has free food - add all that on top of irritation at The Man and you have a recipe for the long haul. But despite the free donuts, the GTFs love their students and want to do right by them. We want to return to work. We even want to grade the hundreds of poorly written essays that we usually complain about! But if the University of Oregon continues to ignore our demands and treat us unfairly then we will continue to strike.This union is not going to back down, so our Administration needs to. The University of Oregon doesn't deserve the PR nightmare that the Administration's absent leadership skills have given it. It's time to start running this University like it's a non-profit School rather than a for-profit agglomeration of sports teams. Give us a fair contract now, let us grade those finals, and together let's move on to the next chapter in our history.